With the increasing amount of time and data needed to create computer models for science problems, it’s no surprise that many disciplines have developed specialized software to fit their needs. Biology is no exception. Is it possible to develop a computing language that is both user-friendly and can help build models for a broad range of questions? Would this give already-developed resources more mileage if more researchers could learn to use them more easily? WID researcher Laurence Loewe thinks so. 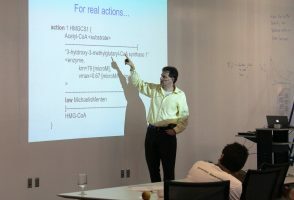 Receiving the prestigious NSF Career Award for his approach to computational biology, Loewe is developing a language called “evolvix,” a biologist-friendly computing language aimed at making it easier to describe biological systems in such a way that allows scientists to simulate them in computers. Loewe’s research generally focuses on ways to quantify evolution — a process that influences problems ranging from antibiotic resistance to species extinction. Loewe discussed his plans for evolvix and the NSF award. How will your research, supported by the NSF award, make computational research easier? Loewe: Computers are great at exploring what happens if a set of precise conditions are met by simulating a corresponding system of interest. Traditionally, each ‘what if’ scenario requires a lot of work for building and exploring that scenario. We can only invest in a few at a time if we do not automate the process. If programming such scenarios is more streamlined, the process of constructing scientific models becomes much easier. These can be used to explore what we know about systems like antibiotics resistance, the cholesterol pathway or the circadian clock. Without a well-integrated programming system, we’ll still be testing different scenarios but it will be more like stabbing in the dark instead of a systematic search. The question is: How many stabs in the dark do we get? If we don’t have these modeling tools, we get a few stabs. With good modeling tools, it will be much easier for research to leap forward with more stabs. So you’re saying the time and data resources for each “stab in the dark” are reduced because of the easy access to better modeling tools? Yes. It has a lot to do with managing the details of what it means to build a model. For example, models have different parameters that are often drawn from the scientific literature. Easy access to these sources will reduce the time researchers will need to check or improve a model. I think there are a lot of small things that can save a lot of time if put together. So this language allows you to keep track of many parts in a system at once? Exactly. For example, if you have one molecule here and another molecule there, then they act independently; that means they could be involved in different reactions at the same time. The world is a parallel system, yet we aim to simulate it on sequential computers. One of our research interests is to develop algorithms that help in this translation. My group aims to pick the best ones out there, implement them into the evolvix language and make them easily accessible for biologists, so they can get a head start in modeling. I hope this will make it easier to connect models to real data. From all sorts of different sources. There’s wet lab data, there’s literature data. I’m working with John Yin and others in the building and across campus to keep our modeling close to observable data. I made the strategic decision to not create data in our own lab so we can fully focus on developing a user-friendly system. Essentially, our development thrives off the input from real users with real data. That is why I am actively seeking input from potential users. I want to know what would make evolvix a system that people would want to use on their own. This topic was also discussed during the workshop on evolutionary systems biology that I organized here in Madison (30 July-1 Aug, 2012). One reason why I think my approach to evolvix can succeed is because I’m a user myself — I’m a biologist who wants to use this. What does the NSF Career Award mean for your research? It is an important confirmation. I’ve been dreaming and thinking about this system for a very long time. This award means that I can now start turning these dreams into usable realities. As a part of this award, there is also a large outreach component. I plan to use this language for teaching purposes to ease people into modeling without a huge amount of overhead. The world is full of models, and it’s vital that we as a society learn to distinguish good models from bad models. I want to provide students with good tools for this important task.